This sign ideally should be placed on the gavel of your farm so as people enter they can be aware of the dangers that can be around a farm e.g. Beware of livestock and farm machinery. Also to alert people that farms are not a playground for children. Suitable for cross compliance audit purposes. 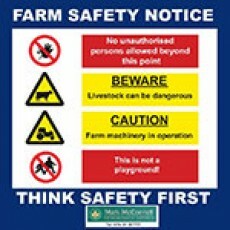 These professional Farm Safety signs can be delivered right to your door throughout Ireland.